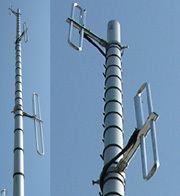 VHF Collinear antenna with 4 folded wide band dipoles ranging from 135 to 175 MHZ. 9DBD gain in offset configuration and 6DBD in omnidirectional configuration, ideal for repeaters. Heavy type antenna made of a 2007 T4 and 6060 T5 aluminium alloy. It is mounted on a mast with a diameter of 40-60mm. Manufactured for 5 frequency ranges: 135-145 MHz, 145-155MHz, 155-165MHz, 165-175MHz and for one radio amateur range, 140-150MHz. Their nominal size is in between frequencies 140MHz, 145MHz, 150MHz, 160MHz and 170MHz. Its SWR is less than 1,5:1 and, finally, it is equipped with high quality, Power handling 500W, completely isolated harness, connects to a 50 ohms line by a N-type Connector. The set includes 4 folded dipoles and the Harness.